This mix has been brewing, or perhaps brooding, for around six months; after three months it became a solid playlist and finally it came to fruition last week. So then I thought, what better time than to release it on Valentine's Day. As the title suggests, it should come as no surprise that each track features the word 'love' in its title. Awww? Vom in your mouth? Personally I care very little for the mythology and commercial exploitation of V day, so please believe me when I say I'm not seeking to capitalise on the occasion. Moreover, my actual intention upon realisation of the timing was to release it in solidarity with fellow singletons, because it can be a tough day for some. So, two fingers, quite frankly, to V day, in a kind of V shape. And here's to love, between lovers, between friends, between citizens, because goodness knows the world needs some. 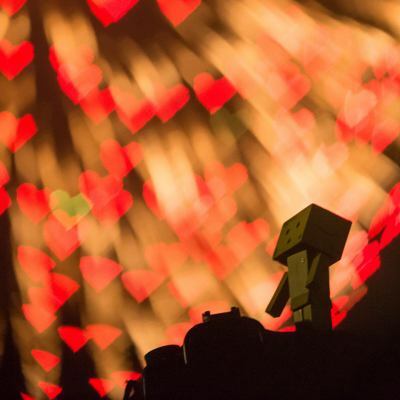 Artwork: Danbo enjoys the fireworks of LOVE by Takashi Hososhima (CC BY-SA 2.0).